This training game focuses on building up through the center. Afterwards, the ball shall be played towards the side to play a flat cross into the middle – just like you know from Pep Guardiola’s Manchester City. A field with the width of the box is marked out between the two penalty areas. At both end, new boxes are defined. The field between those has two outside lanes with an extra zone around the halfway line within both of them. A neutral player is positioned in each one. In the area between the outside lanes, there’s an octagon that is linked to rectangles next to both penalty areas. Next to the octagon, there are small empty spaces. Sounds complicated? It arguably isn’t the easiest setup. But for this we have graphics. 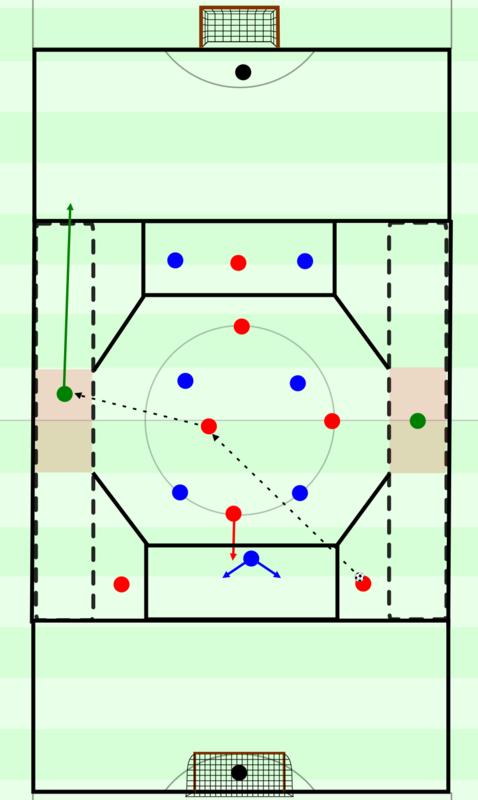 One of the teams starts with the ball from the position shown in the graphic. Both of their center backs are positioned in the areas next to the rectangle. Within the latter, there’s an opponent player (striker). The build-up players can be attacked by any number of opponents, once the game begins. One additional player of the team in possession can drop back into the rectangle. At the same time, the ball can be passed back to the goalkeeper who can also be attacked by the defending team. Within the octagon, there’s a 4 versus 4 at the beginning. The attacking team tries to pass the ball from center backs (or dropping midfielder) to one of the players inside the octagon. The goalkeeper is also allowed to play controlled chip balls there. Once the ball reaches the triangle, the receiver needs to pass the ball outside to one of the neutrals who is either still in his initial box or left it to go forward. The neutral can dribble towards the penalty box within his lane and cannot be attacked. Meanwhile, a 2 versus 2 is created inside the goal near rectangle. The attackers can attack the box (offside rule!). The neutral can cross the ball for them to score or dribbles into the box by himself and finishes the attack, if nobody closes him down. After the defenders win the ball, there’s a free game inside the whole area that was marked out at the beginning until the game is stopped (ball out of bounds, goal etc.). The team that scored starts the next round. If there was not goal, the roles changed compared to the previous round. Be sure to count the overall score. Neutral players can be attacked once they get the ball. The breakthrough must still happen through one of them. Ball far neutral player can also attack the box. Breakthrough in any legal way. Neutrals support. Allow dribbling oft he build-up players into the field. They can also dribble outside. The neutral needs to go inside in that case. Direct pass from build-up player to the far neutral or to the striker is rewarded with an extra point. Overall, this training game has quite an implicit focus. Initially, it’s all about understanding all the rules. You should take enough time for that and deal with some kind of mental overload. For example, you may use the effect of, “incubation”, literally to Introduce this drill on one day and play it again on the next one. In this case, you should only start to coach more explicitly on the second day. At the beginning, the build-up players have an numerical advantage and can play back to the goalkeeper as well. Within the octagon, there are equal numbers which the defending team might use for man-orientations. If this is the case, movement needs to coordinated and the center needs to be bypassed through quick combinations (lay-offs, one-twos, third man etc.). Because the pressing team can move freely the probability of them applying pressure on the build-up is quite high. Thanks to that, a free man in the center can be generated. He needs to move out of the cover shadow in ball near areas or drop off on the far side for diagonal passes. If the opponents apply more of a zonal marking, you need to position yourself in between as much as possible. If the pressure on the build-up player in possession of the ball becomes too high, either a midfielder can drop or the ball is played back to the goalkeeper. If the opponent also puts pressure on him, you created space for a chip or laser pass between the lines. If nobody runs through to the keeper, he has time to secure possession and can switch the point of the attack until space is successfully opened. The neutrals should move in such a way that they are positioned as high up as possible to receive the ball into space with their far foot. The pass towards them should ideally be played diagonally. Once he controls the ball, the neutral needs to perceive the movements in the center of the field. The attackers need to act in a coordinated manner to get on the blind side of the defender(s). If the movement is not correct, the neutral dribbles into the box by himself. It’s always important to cover these actions in the best way possible to immediately create access in counterpressing after losing the ball. The ‘second wave’ might get a goal, then. The opponent can, for example, counter through the ball far neutral. This needs to be prevented.